Boston’s tax-exempt land totals nearly half of all land area in the city. Federal, state, city and other governmental land comprise 18.45 square miles (sq. mi. ), while privately owned tax-exempt property, including medical and higher education institutions, churches and others totals 4.98 sq. mi. Public and private tax-exempt area combined makes up 49% of the total city land area of 47.84 sq. mi. 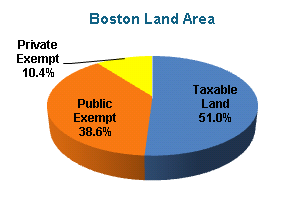 Government-owned tax-exempt land represents 78.7% of all tax-exempt real property in Boston. The Commonwealth owns 48.5% of total tax-exempt land followed by the City of Boston (28.6%) and US Government (1.6%). In total, publicly owned tax-exempt area represents 38.6% of all land area in the City. Private tax-exempt property makes up 21.3% of total tax-exempt land and 10.4% of total city area. Religious property, such as churches and cemeteries, constitutes 4% of total city area. Medical, educational and cultural institutions constitute about 5% of city land. Boston’s total assessed property value in FY17 is $190.3B, of which taxable property represents $138.1B or 72.6% and tax-exempt $52.2B or 27.4%. The City does not continually update tax-exempt values so the description of tax-exempt property is limited to area here. However, the City did determine the property value of the 49 largest medical, educational and cultural tax-exempt institutions as part of its payment-in-lieu of taxes (PILOT) program. Currently, the property value of these institutions totals $13.9B, which represents 47.8% of total private exempt value. The $13.9B also represents 26.7% of all tax-exempt value and 7.3% of total property value in Boston. Next story 2017 Shattuck Awards Success! !